Everyone thinks the Oscars are the diamond-glitter-dust Awards Ceremony, but that's a bit of a misnomer: sure it's all fancy and frou-frou but the Screen Actor's Guild Awards is where you can see your favorite A-list movie AND television stars, frolicking together like it's nothing. 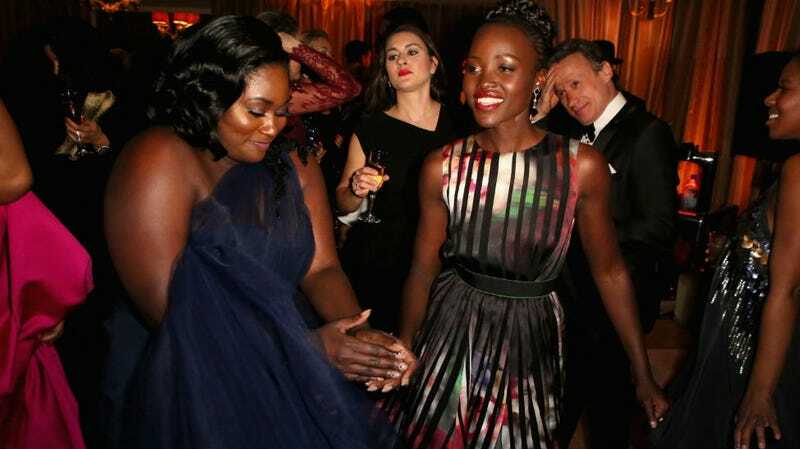 Like Oscar winner Lupita Nyong'o and Netflix superhero Danielle Brooks having a total dream of a hang sesh. But what were they wearing? Oh winter florals, how I adore thee! The watercolor print Game of Thrones' Natalie Dormer wore was a blotch of spring in a cold hard world, a Naeem Khan to remind us that while Winter May Be Coming, blooms are quick to follow (even if we are all just cannibalized corpses by then). Lupita Nyong'o continues to stunt upon us all, evoking love and light and, if you are me, the rave shower you've been wanting all your life, in a gorgeous silken Elie Saab. And the radiant Rashida Jonesis giving us intricate papercut art in Emanuel Ungaro, super stark and modern. Speaking of Stark (ayooo! ), how chic does Arya aka Maisie Williams look in red lace? Did you even know that was Arya Stark? Did you recognize her without needle and like, a small boy's suit of armor? Guess what, she is a Regular Fly Teen in real life, and Game of Thrones does not exist perpetually even outside of your television. Who knew? Julianne Moore is a ravishing emerald in Givenchy, and a person who knows well the basics of the color wheel. Do you forever, darling. Sidebar: one time saw Julianne Moore walking down on 14th Street in Manhattan, she was wearing zero make-up and still looked the visage of perfection, god bless. Had no idea who Sophie McShera was until I looked her up, apparently she is on some old-timey show called Downton Abbey? Whatever, there is nothing old-timey about her dress, which is completely captivating: maybe it's because she is British but this interesting type of gown is never seen on these kinds of red carpets but the glooping, poppy black detailing on her pink gown feels very edgy, like a Korean streetwear designer made it. On the other hand, the god Viola Davis is classic Hollywood and statuesque as hell, as conventionally beautiful as she damn wants to be, the truth cannot be denied. The colorblocked top/skirt gown is a good way to go, and both Natasha Lyonne and Sarah Paulson are doing it right: they could wear their dresses straight to the afterparties with no compunction, as on point for black tie as cocktail time. Lyonne's Orange is the New Black costar Selenis Leyva is boss as hell in her own version of the look, poppy appliqués on a look by Bibhu Mohapatra, totally bombshell. Imagine the gossipy three-way call between Orange is the New Black's Annie Golden and Lea Delaria with Julia Roberts, an only moderately unlikely kiki about wearing matching tuxedo looks to the event? If they all show up to the Oscars in monogrammed tracksuits, we'll know it's real (and/or they formed the illest new R&B trio). It is so easy to make slight missteps with texture, you guys. Okay but first off, can someone please tell Hollywood that it is NOT all right to pair cobalt with black because Juliana Margulies's gown/shoe combo is literally breaking my face. THE HORROR. Naomi Watts stopped off at Michael's to beef up her look with a little pipecleaner thingamagoo, and while there's really nothing too egregious about Maggie Gyllenhaal's look, something about it just reminds me of an Amstel Lite. It's by cool-guy Thakoon, though, maybe that's what he's going for. Rosamund Pike's couture Dior is made for movement, so perhaps that's why in standing stance she appears to have been swallowed whole by a lovely, rare human-eating rainforest orchid. Normally Uzo Aduba looks breathlessly on point, which is why it is a shame to reckon with the confusing knit pattern in this Angel Sanchez gown? Maybe it's better in person? No, your eyes do not deceive thee: that is Gabrielle Carteris, aka Andrea from the original 90210! She's now the Executive Vice President of the Screen Actor's Guild and is magical in that she looks exactly as old as she did when she was supposed to be playing a high school junior. That ensemble is very Andrea-esque, thus fulfilling all of our hopes and dreams. While we're on the topic of davenports, I literally just Craigslisted a year-old West Elm couch that looks identical to Camila Alves' gown! Same eggplant, same material (I think), same drape! Uncanny, moreso in that my male roommate/manfriend currently has the exact same dubiously unkempt winter beard as McConaughey. Camila should we be friends? Moving away from minimalist décor, we have OITNB's Vicky Jeudy in a virulent combo of ideas which include: Carnival, pageantry, Vegas, plaid, Burberry, and knives. Color's great on her. But I don't not hate it! People I really do not hate: the GODS Debbie Reynolds and her daughter Carrie Fisher, the former of whom received a Lifetime Achievement Award for her work in Hollywood over the last half-century-plus. I would like to add to said Lifetime Achievement that this chick is 82 years old and still rocking a bare leg and 30-odd pounds of sequins like "and what," and while she is renowned as, like, the nicest lady alive, you know she will cut a dude if it comes down to it. Her daughter is also a boss and my life-idol: have you ever seen the Comedy Central roast of Roseanne? Or read her hilarious memoir, Wishful Drinking, or watched the accompanying stage show? If so, you know that she was probably sitting through this entire SAG Awards smoking a Blu E-Cig and wearing those dark glasses in order to obscure her copious eye-rolling. Her ensemble is totally party on the top, business from the neck down, just to see if you're paying attention. If not, she will not hesitate to snap on you, and you will know that you have deserved it. LIFE. IDOLS. This has been Jezebel Presents The Muse Presents The Outfits of The SAG Awards, good night!